Each type of event brings different challenges, and PARTY HITS is equipped to make the absolute MOST out of any occasion! It all boils down to experience, communication, and preparation, plus a sincere desire to have fun! No question about it, you want a party that is fun, fast-paced and dazzling! Do we bring special effects? Oooh yeah! Bubbles, fog, lazers, strobes, mirror balls, intelligent lighting and programmable LED’s, plus a HUGE sound system to pump out the latest hits and all-time party classics! You ever notice how no two jobs are the same? The same is true of companies and their people, so PARTY HITS gears the show to YOUR group’s needs. That means music for any mood or generation, plus games to break the ice and the ability to help with your announcements and party agenda. Wouldn’t it be great if you could talk with your entertainer ahead of time, and really plan a show that will put your group into orbit? Consider it done! At PARTY HITS, we work with you to tailor just the right music, mood, gear and games that will have everybody talking–all the way home! Just be warned: After booking PARTY HITS, you will be the official party planner for your group FOREVER! Need an experienced Master of Ceremonies for your event? How about top-of-the-line microphones and sound amplification? Party Hits has you covered! We’ve got YEARS of experience hosting every type of company or community event, whether there’s music involved or not. So when you need crisp, clean sound for your gathering, and/or a trained and personable host to keep things moving along, give Party Hits a call! Wait just a minute! Did we forget to name YOUR event here? Not to worry. Give PARTY HITS a call today at 715-874-5244, and just TRY to stump us! Odds are PARTY HITS has been there…and that’s what makes us your best bet for the perfect entertainment, whatever the occasion! 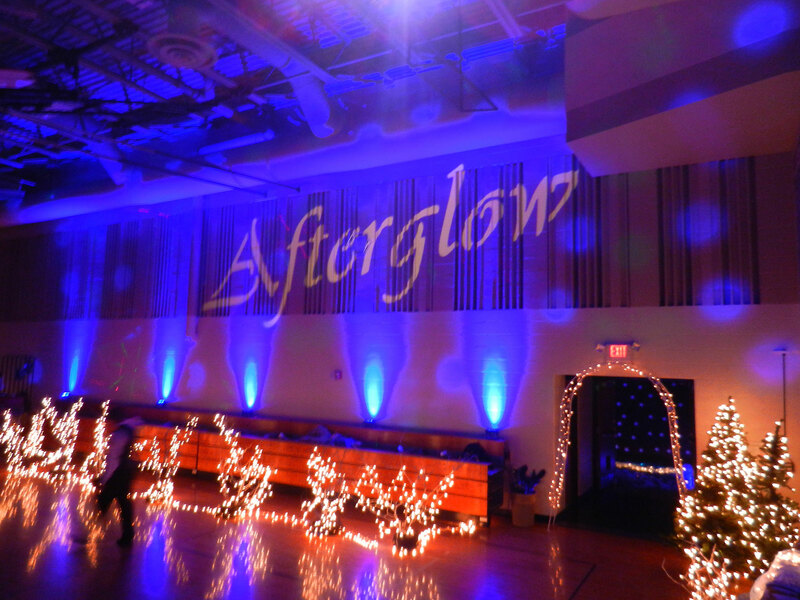 We can project almost any phrase or words on the wall or ceiling!